By John Traffas | Mr. Traffas holds an MA in Theology and is about to retire as a US Mail carrier in Atchison, Kansas, where he is actively involved in Benedictine College’s Plato Reading Group. When the old Blessed Sacrament School/Bronx valedictorian Sonia Sotomayor issued a stay on New Year’s Eve to prevent the application of the Affordable Care Act’s contraception / abortifacient / sterilization provisions to the Little Sisters of the Poor in Colorado, many readers of the story might have thought the associate justice was helping the defenseless. A headline on the Washington Post blog two days later–“Obama administration takes on nuns”, regarding the administration’s request that the Supreme Court deny an injunction for the Sisters –implied a mismatch of ability. The first thing I thought of was how devoid of historical memory this administration is. Did they not remember the 1987 NFL lockout? 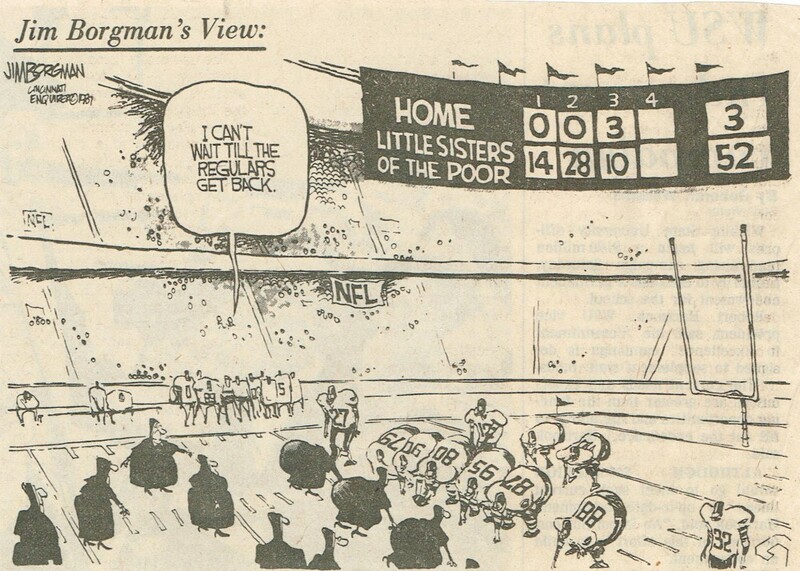 Pulitzer-prize winning cartoonist Jim Borgman portrayed the Little Sisters of the Poor trouncing replacement players back then. It is plausible to assume that the application by a religious group of the actual content of its moral teaching would enjoy even more freedom from “interference from the civil authority” than the group’s property, at least according to the thinking of Jefferson. The present administration is imposing a public orthodoxy about the components of health care that would have left Jefferson as appalled as are the Little Sisters of the Poor.